Cover stitches – great for sewing elastic hems, perfect for finishing all kinds of knitwear hems. 4-thread over-lock – reinforced overlock stitch for perfect sewing, trimming and finishing. 2-thread over-lock – rolled edge and flat lock, wide and narrow. German Innovative Design – Built to make sewing easy and to achieve the professional results that sewers want. 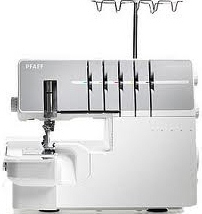 The PFAFF® coverlock™ 3.0 overlock machine with its innovative features, durability and ease of operation makes it the serger for you. Speed – Sews 1100 stitches per minute to save time. 2 sewing speeds. Use the slower speed when you want more precision. Stop in today for a demonstration.